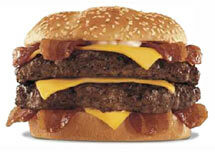 SupersizedMeals.com - Hardee's Thickburger - Awesome! Not terribly impressive. I used to work as a short-order cook at a 50's nostalgia diner, and all of our burger patties were 1/3 pound. It really wasn't odd to have people walk in and order a double, with bacon, cheese, lettuce, tomato, and fries and a shake on the side. The Thickburger? Just a snack really. That's the size that burgers should start at, and just get bigger. Yeah, haven't tried one of these yet, but the photo was impressive! I've had it. Multiple times. It is monstrous. The two biggest standard fast food chain burgers you can construct today are the Hardees Monsterburger, and the far mightier tripple whopper with double cheese, double bacon at Burger King. Try ordering a tripple whopper with multiple amounts of bacon & cheese added to your burger, and you will get nothing but a look of horror from the face of the cashier. While a Monsterburger from Hardees will render me sleepy for an afternoon, the Ultipmate Tripple Whopper will put me into a food coma.